The guides were always friendly, happy and eager to make our trip safe, fun and relaxing. I commend them, they work really hard. There were opportunities to hike each day or just relax in camp. Also, there were options to use the inflatable kayaks in the rapids. No pressure. I must really commend Holiday for the food, and of course, the guides who did all the cooking. It isn’t easy to satisfy the many palates of people but you guys did a great job of it. All the fresh veggies and fruit make a healthy meal. Thank you. 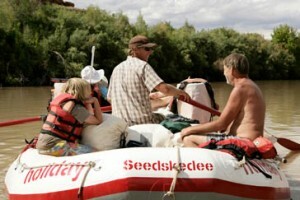 I have been rafting and kayaking rivers since the early 1980’s – all private trips. 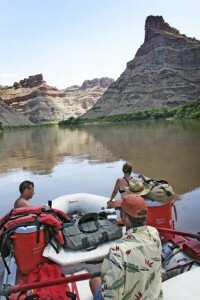 This was my first commercial river trip. I was apprehensive about commercial river trips because most of them use motors and I did not want to be in the heart of nature listening to a motor. Another concern of mine was: how experienced are the guides? The first day or two of the trip I watched carefully and spent time on each boat, thinking, I want to be on the boat with the best guide when we run the rapids. In my humble opinion, all guides were equally experienced. From that time on I didn’t care whose boat I was on in the rapids. And so: I relaxed in camp, hiked, ate great food and enjoyed the beauty of Glen Canyon from my reclined position on the boat. I had no work; like cooking or setting up the kitchen, rigging or unrigging the boat, and no groover duty. I can get used to this! Thanks.